Paulist Press | Hardcover— Child’s Guide to the Rosary brings alive to children ages 6 to 8 the mysteries of the Rosary. Each Joyful, Luminous, Sorrowful, and Glorious Mystery is explained with scriptural references in a kid-friendly manner. Interactive questions and charming color illustrations by Anne Catharine Blake will engage both child and the adult reading along. Instructions on how to pray the Rosary are included at the end of the book. The beauty of the Rosary has always been in its ability to join us in prayer and meditation with the Blessed Mother through story-telling. 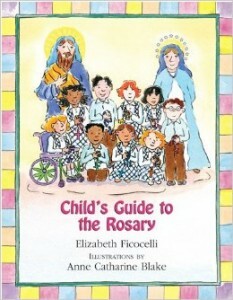 Elizabeth Ficocelli’s latest children’s book, Child’s Guide to the Rosary, does that with simplicity, beauty and reverence. The instructions on the mechanics of praying the Rosary are simple and easy for a child to follow. This guide is a wonderful tool for introducing our children to a devotion that will serve them throughout their lives. Hands down, this book was the most well written I have ever come across for young people. Even though it suggests the best ages of readers is four to eight, I have no problem reading it to my eighth grade catechism class as well. Our younger generation is no longer satisfied with having “blind faith.” They want more explanations in terms they can understand. I initially ordered this book for my young niece and nephew, but I will order more and plan to have them on hand all the time. After seeing this one, I will also be ordering the complete collection. God Bless you, Elizabeth Ficocelli and Anne Catharine Blake! Great for all ages! I loved it at first sight, and my granddaughter expressed the same sentiments. One must be a child at heart, I guess, and this book was refreshing to me as a grandparent. It makes the point without beating anyone over the head. As an Episcopalian, I can now better explain the use of the prayer beads our children made as a class project, and why we use them as a devotion to Mary, God, Jesus, and the Holy Spirit. I purchased this book along with a set of rosary beads for my nephew’s First Holy Communion. It was easy to read & explained how to pray with rosary beads along with different prayers. It was a really nice book & made a nice gift.